In recent years, political scientists have started to explore the spatial dimension of various social phenomena, such as wars, elections, and development. Traditionally, the discipline has focused more on change over time, as in scholars’ many time series regressions examining and reexamining the relationship between economic growth and democratization or between democracy and war or historical institutionalist case studies analyzing shifting class alliances, regime types, and state power across centuries. Comparisons between different geographical settings have always been central to political science, of course—hence, the sub-discipline of “comparative politics”—but these differences have typically been conceptualized with reference to neat political boundaries (“country x has experienced something, while country y has not”). The new spatial turn, in contrast, emphasizes variables like distance, terrain, and, less quantifiable, the lived experience of different natural and manmade environments (what Tarrow calls “concrete space”). This fresh focus has already yielded important insights. For example, by documenting the correlation between civil war violence and local distributions of ethnic groups and local economic measures, rather than aggregating and using, say, national-level measures of “ethno-linguistic fractionalization,” Cederman, Gleditsch, Kristian and Buhaug (2013) have found that ethnic inequality is a powerful spur to conflict, after all. This challenges Fearon and Laitin’s (2003) prominent argument that differences in state capacity, not relative gaps between rich and poor, separate stable from unstable countries (an argument that itself drew on a novel use of terrain measures). Chen (2013), meanwhile, has shown that more than Republican gerrymandering is responsible for America’s unrepresentative congressional election outcomes: the increased concentration of Democrats in urban and suburban areas, too, is a factor. Others like Min, Gaba, Sarr, and Agalassou (2013) and Lü and Landry (2014) rely on satellite measures of night light to measure electrification and, indirectly, economic development. In terms of qualitative work, Wood (2003) has used map-drawing exercises to capture the feeling of agency that she says undergirded participation by campesinos in El Salvador’s leftist insurgency. My own dissertation concerns the political impact of rising Chinese labor unrest. Anyone who has studied China has doubtless received the following response to their work at one point or another: “Yes, that is probably true in [insert province / city / county], but that place is unique for the following reasons….” Given the degree to which economic structures and local authorities’ implementation of central government policies vary from region to region in China—the country has been called an example of “decentralized authoritarianism” (Landry 2008) and “fragmented authoritarianism” (Lieberthal 1987; Mertha 2008)—this response has considerable merit. Indeed, with regards to Chinese labor politics, in particular, the experiences of state-owned enterprise employees with memories of a Mao-era “socialist social contract” in the northeastern rust belt are far-removed (or at least have been until recently) from those of the new working class of migrants from the countryside employed in southeastern, export-oriented sweatshops (Lee 2007). At a more granular level, as my field research is showing, migrant workers live very different lives in the Pearl River Delta versus the Yangtze River Delta. To overcome the challenge posed by this variation—and to go further and actively take advantage of this variation—I have been building a crowd-mapped and geo-referenced data set of strikes, protests, and riots by Chinese workers called China Strikes. At present, the data set includes 793 incidents occurring between 2008 and 2012. Each incident is coded with a longitude and latitude and according to the sector in which it occurred, enterprise ownership type (state-owned, foreign-invested, etc. ), number of workers involved, worker grievances, and immediate state and company responses. The vast majority of the disputes captured by the data set were discovered through searching state newspapers, social media, blogs, and activist websites. But China Strikes is also linked to a website (https://chinastrikes.crowdmap.com) that allows visitors to submit incidents themselves. All reports are plotted on a publicly accessible digital map with links to relevant articles, photos, etc. Another mapping project by the Hong Kong-based organization China Labour Bulletin (CLB) (http://www.numble.com/PHP/mysql/clbmape.html), which began in mid-2011 and continues to the present, has allowed me to check my work against that of others. Today’s software makes projects like mine or CLB’s relatively easy. 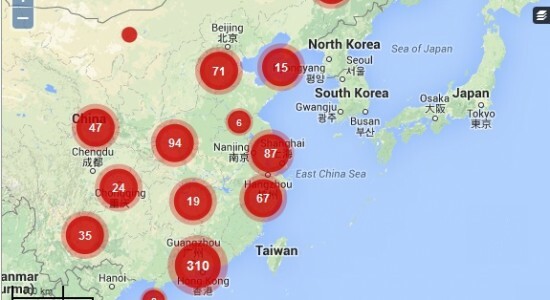 China Strikes is built on the free Ushahidi (https://www.ushahidi.com) crowd-mapping platform. Ushahidi was developed by Kenyan activists documenting violence surrounding their country’s 2008 elections and has been used by a range of advocacy groups in recent years. It takes very little practice to master—much less than expensive GIS programs like ArcGIS (http://www.esri.com/software/arcgis/), which I have begun using to analyze correlations between the incidents in my data set and local socioeconomic indicators. Similar platforms to Ushahidi include Open Street Maps (http://www.openstreetmap.org/), and Google Map Maker (http://www.google.com/mapmaker). I cannot speak to the strengths or weaknesses of these alternatives, but the expansion of digital mapping options can only benefit scholars. Of course, spatial analysis is no silver bullet. It does not necessarily resolve the thorny issue of sample bias, in particular. Even the 793 incidents I have captured are a vast understatement of the total level of labor contention occurring: estimates of annual workplace collective actions in China range in the tens of thousands (see, for example, China Labour Bulletin 2011). What factors “select” one incident rather than another into my data set? Could China Strikes be measuring the relative ease of reporting in different parts of the country rather than the relative frequency of contention? After all, my map shows incidents concentrated in a part of China (the Pearl River Delta) which borders Hong Kong and just happens to have the country’s most open media environment. China Strikes contains a surprising amount of diversity, covering everything from protests by dockworkers on the coast to strikes by bus drivers in remote mountain towns. Statistical controls can also help correct for regional over- and under-reporting. All the same, this issue requires constant attention. The visualization of research findings, especially in something close to real time, can make scholarship more accessible to the public but also raises certain ethical concerns. Most basically, who does a map like that of China Strikes serve? Clearly it serves my research and, I would hope, that of other scholars interested in Chinese labor issues. Ideally, labor activists, too, will find the data of use. But employers anxious to avoid quarrelsome employees could also conceivably visit my website for guidance, as could authorities interested in clamping down on working class insurgency. I tend to believe that projects like mine mostly serve to level the playing field, given the considerable information already available to economic and political elites. However, concerns about the varied uses to which spatial analysis can be put should not be easily brushed aside (see O’Sullivan on “critical GIS”). More generally, patterns in maps easily draw analogies to “contagions” and “waves,” etc.—all things that intentionally or not can imply a need for greater social control. Researchers should be thoughtful about the language they use to discuss their findings. Spatial analysis offers much to political science and to the social sciences more generally. However, only someone relatively familiar with a particular environment can speak to what a railroad or river or municipal boundary might mean for the people living in that environment. Used carefully, maps can have a quirky, tactile quality that complements fieldwork and archival research; used poorly, they can misdirect attention to things that are conveniently measurable but ultimately epiphenomenal. Like experiments, formal modeling, and other methodological innovations of the past few decades, today’s spatial turn will yield the greatest advances if it builds on techniques honed in the past. This post benefits immensely from training I have received from David S. Patel. Cederman, L.-E., Gleditsch, K. S., & Buhaug, H. (2013). Inequality, Grievances, and Civil War. New York: Cambridge University Press. China Labour Bulletin. (2011). Unity is Strength: The Workers’ Movement in China 2009-2011. Hong Kong. Landry, P. F. (2008). Decentralized Authoritarianism in China: The Communist Party’s Control of Local Elites in the Post-Mao Era. New York: Cambridge University Press. Lee, C. K. (2007). Against the Law: Labor Protests in China’s Rustbelt and Sunbelt. Berkeley: University of California Press. Lieberthal, K. (1987). Introduction: The “Fragmented Authoritarianism” Model and Its Limitations. In K. Lieberthal & D. M. Lampton (Eds. ), Bureaucracy, Politics, and Decision Making n Post-Mao China. Berkeley, Los Angeles and Oxford: University of California Press. Lü, X., & Landry, P. F. (2014). Show Me the Money: Interjurisdiction Political Competition and Fiscal Extraction in China. American Political Science Review, 108(03), 706–722. Mertha, A. C. (2008). China’s Water Warriors: Citizen Action and Policy Change. Ithaca: Cornell University Press. Min, B., Gaba, K. M., Sarr, O. F., & Agalassou, A. (2013). Detection of rural electrification in Africa using DMSP-OLS night lights imagery. International Journal of Remote Sensing, 34(22), 8118–8141. Tarrow, S. (2006). Space and Comparative Politics. APS, 17(1), 1–4. Wood, E. (2003). Insurgent Collective Action and Civil War in El Salvador. New York: Cambridge University Press.